So, we contacted Ryan Cuthriell of Gusto Design Co. to work with us on solving what proved to be a fairly complex brand identity puzzle. We already had a following and brand recognition as The Glass Jug, but we wanted to rebrand in a way that would encompass the new brewery aspect of the business, without creating two separate brands. We were worried that it would cause confusion if we had one brand for our bottle shop, bar, and beer garden, then another brand for the brewery. We told Ryan that we wanted the new brand to be "The Glass Jug Beer Lab" because we felt that "beer lab" was a better fit for us than "brewery" or "brewing company" since we are doing more than brewing. Also, we liked the sound of a lab because our focus is on small batch and experimental brews where we will constantly be trying out new ideas and recipes. Additionally, it's a subtle nod to the RTP region where there is so much happening in the world of science and research. Even the beer comes from a lab! And, of course, we wanted to keep "The Glass Jug" as part of the name because of our existing brand equity. However, that made it challenging because it made for a really long name. But, it at least gave us a theme. Ryan was able to take the "lab" idea and create a new brand identity that stayed true to our existing roots while also capturing the more scientific look we were going for. We tweaked the color palate slightly, keeping orange and navy as our primary colors, simply refining the exact shades of each. And we kept the bold, block letters for "GLASS JUG." It represents how we are turning our business upside down, morphing from a retail store into a brewery. It is upside down with a drop of beer falling below the logo because our beers are going to be good to the last drop. As you know, we first took a stab at remodeling the previous logo, updating the typography with the jug in the word mark. This didn’t seem like enough. We wanted something more that gave a presence. I remember you all liking various seals and logo lockups from a few other breweries so I took that inspiration and decided to make a new mark, but keeping it as an logical progression. We wanted to give a nod to the previous logo and not make a huge departure, but we needed a proper emblem for a logo. When doing the research, we kept coming back to the scientific nature and chemistry of beer. The periodic table of elements was a cool reference and I loved the idea of you tinkering and messing around with unique small batch craft brews. 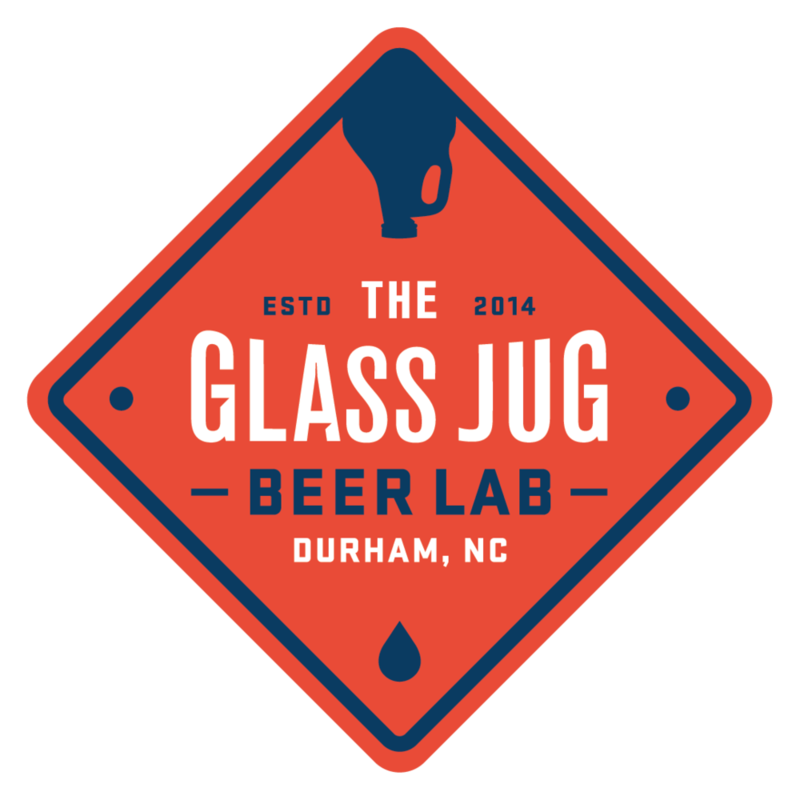 This led to the logo looking like a sign you might find in a lab — and this worked perfectly with the new title of The Glass Jug Beer Lab. We inverted the glass jug at the top giving note to that one last drop of beer goodness at the bottom. The typography is customized which makes the wordmark in the logo unique. This updated mark just has a bright, positive and uplifting feeling to it. It’s modern but classic too. It is well balanced, much like the beer. I really enjoyed getting to know and understand my clients — Chris and Katy are just super nice and down to earth people. It was fun working with them each step of the way and pushing what this new mark could be. Once everyone bought into the Beer Lab idea, the logo was quick to evolve. I love the final phase of the brand identity where I stamp out all the variations and color versions of the logo. I like to provide a large palate for my clients to use and play around with. Having a new brand should be fun. I like how adaptive it is — the logo can be used with or without the background sign encasing it. Also the color palate is just cool and modern. We're really happy with the new branding and are already starting to incorporate it into our new apparel and merch. Sweatshirts with the new logo are in stock now and hats will be in stock by the time we move into our new space. We'll be rolling out new t-shirts later this spring, also.